Goplus 6'' Mechanic Bench Vise w/Anvil (Swivel) Table Top Clamp Press Swivel Base Heavy Duty by Goplus at Tizimi Press. MPN: 11AA. Hurry! Limited time offer. Offer valid only while supplies last. This 6-inch bench vise is constructed with heavy duty precision-machined anvil to deliver incredible strength for gripping all kinds of objects. 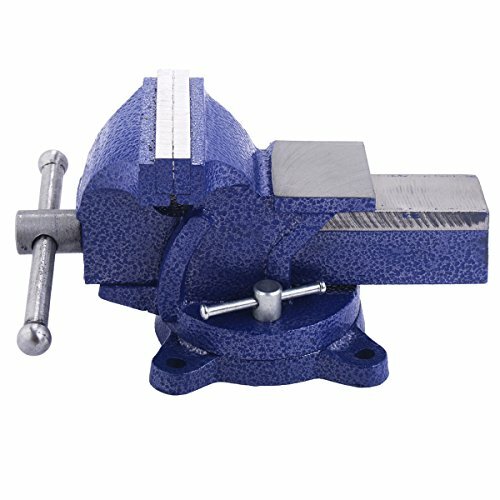 This 6-inch bench vise is constructed with heavy duty precision-machined anvil to deliver incredible strength for gripping all kinds of objects. Whether you are working with wood or metal, the Instant Acton vise screw opens and closely quickly, and the bench vise base swivels 360 degrees to give you the best work angle. It is ideal for providing maximum clamping and holding power. Don't hesitate to buy one now! 【Sturdy and Durable】Durable cast steel construction, so that the product is not easy to be damaged by external impact, increase service life. 【Large Anvil Work Surface】 It makes it possible to process multiple sizes of materials. 【Adjustable Direction】360 degree swivel locking base ideal for turning in any direction as desire after mounting, meet different needs. 【Strong Practicability】Power serrated steel jaws and clamps for great grip and strength，provides maximum clamping and holding power. 【Widely Use】It is perfect for home or business application, whether you are working with wood or metal, you just need to install it on the bench top or working truck and you can use it.